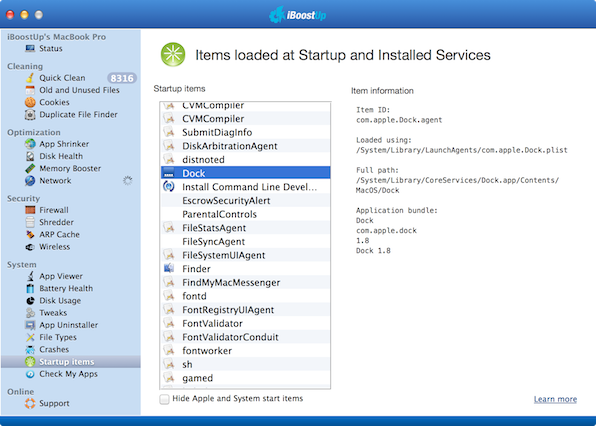 Below is a selection of Mac App Store reviews by real iBoostUp users. This new update has gone from AWESOME to beyond it. App Uninstaller has been added and now there is a premium version which I recommend (it is not that expensive) because you will save a lot of money and will have all the new features that the future version of iBoostUp has to offer. I love how iBoostUp really listens to their users and although this version has taken longer than usual to get released it is worth it and I am pretty sure updates will continue to be ask quick and good as they used to be. Overall, a great job to the iBoostUp team and can't wait for the future updates. It is defenetly a 5 star product and a must have! Keep up the work!! I don't have any words to describe how much faster my mac is after I used this. Not to mention how much free space I saved. I'd appreciate a slight decrease in the price for add-ons but other then that this is worth downloading. This is a great app for doing some quick cleaning and maintenance and keeping things running smoothly. This is especially the case for people who either do not want or do not know how to accomplish these tasks within the system or using other tools. Convenience is worth paying for. Real quick: For the people who are giving one star because some of the features require an in-app purchase, that's just not fair. Perhaps there was a time when the description was not entirely clear, but there is a person who reviewed this app on April 1, 2012 (3 days ago) who is complaining that the duplicate file finder is an in-app purchase for Lion users. The description very clearly says this is the case. No stars for you! 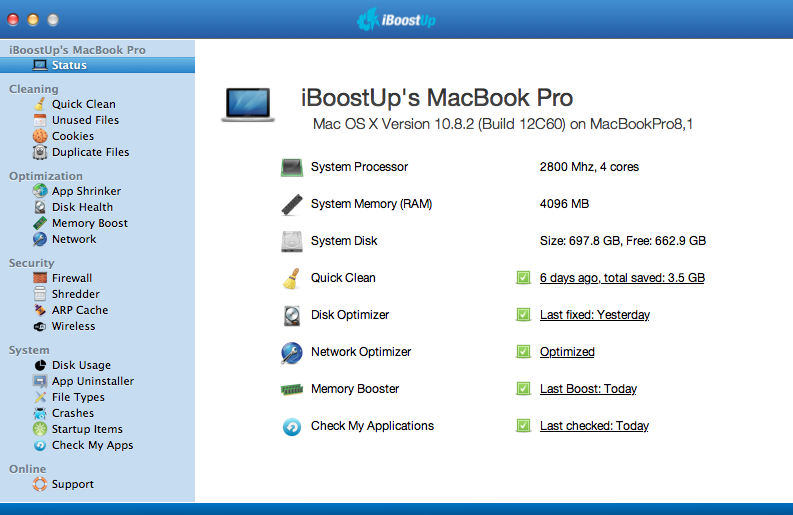 I love iBoostUp! It's a must have app if you love your computer as much as I do! Download it for real! I am not kidding!!! :D I love version 3.0!!! I am planning on getting the Premium version so I can have all the future features :) My friend told me about this app and well, I really recommend it!! It's a lot better than the other apps. It is easy, fast, and a really good app. It first started just being a cleaner and then it is just so much more! 5 stars fo sure! APP WORKS JUST AS DESCRIBED KEEPS MY MAC RUNNING SMOOTH KEEP UP THE GOOD WORK. i just updated my macbook pro to snow leopard (i know, im late to the party). after updating my mac I found it to be very sluggish when opening programs it never had a roblem on leopard like: word, excel, Itunes, even google chrome! i was a bit annoyed. i have other computer programs to clean my mac but they didnt help. then i found this one in the app store. 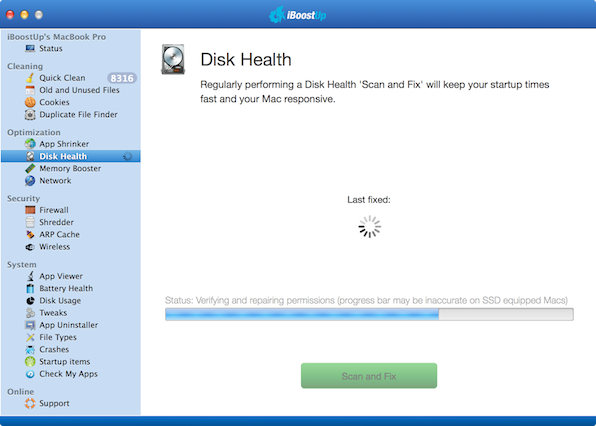 after running disk health on IBoostUp the problems stopped and my computer has been my mac has been much faster when opening prorgrams! this app brakea down evrything so it is very comprhensable to someone with little, to no computer skill. if you are haing problems with your mac and you dont want to spend money on apps that do the same thing thing then i recomend you get this app ASAP! Works great. The only thing I want to see is Disk Health for external drives. I paid for a couple of the extra features (about $5 total). I feel that wasn't a bad price considering how expensive programs can be to clean up your computer. App works great everytime and breaks everything down. I really love this app. Totally worth the money I spent and will use this app all the time. Don't hesitate downloading this great app. Also, I saw a review saying it deletes the downloads files…..you have the option to only delete what you want and to delete them and make a copy of them in their own separate folders. This App is Amazing! Does what it says, and it does it well! Also they continuasly update and not a single update has been a bad thing! Definately worth it! This app fixed my MacBook Pro, which had been experiencing endless pin wheels for the last several weeks. Great app. Fast and easy to use and it made my laptop usable again! I appreciate being able to optimize the function of my mac. I like being able to control what gets cleaned and what doesn't (I prefer to look at my cookies and handle them manually). This app also gave me instructions for how to optimize my network settings according to how I am using the internet. Very user-friendly and fast. I usually don't like to set apps to open at log-in but for now I decided to give it this setting, so I can hit the ground running everyday. Thanks for making this free! I was just browsing for cool apps, saw this and read a couple reviews. I installed it cause its free and i reclaimed 56.8GB!!!!! And It was free! This app optimized my internet settings. It is sooo fast now. Could not believe the difference it made. Cleans everything quickly and efficiently. No complaints here. I have a fairly new computer but I'm trying to keep it clean. 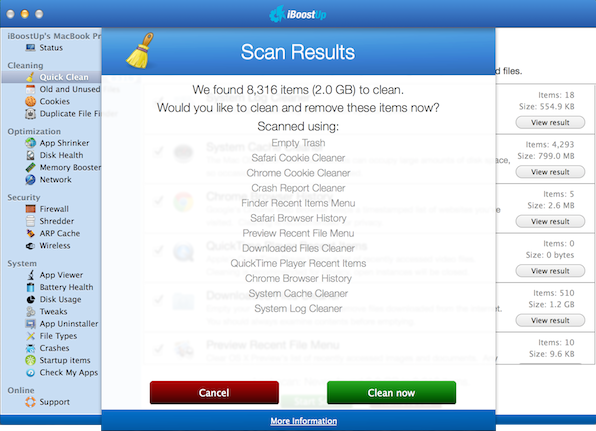 First time I ran it it found over 570 MB worth of stuff to clean. I'm very impressed. Great app! Really nice app, notice the difference right away! Cleared 1gb right off the back. My reboot time has been optimized and the difference is noticealbe. Highly recomend this app.